Make a few incisions into the potatoes, with the tip of a sharp knife (wrap scrubbed and dried potatoes in foil for a soft skin baked potato). Lightly spray potatoes with olive oil and sprinkle on salt flakes. Place tomato, avocado, shallots, chili, lime juice and coriander in a bowl. Mix and season with salt and pepper to taste. Remove baked potatoes from oven and with a sharp knife slit across the top. 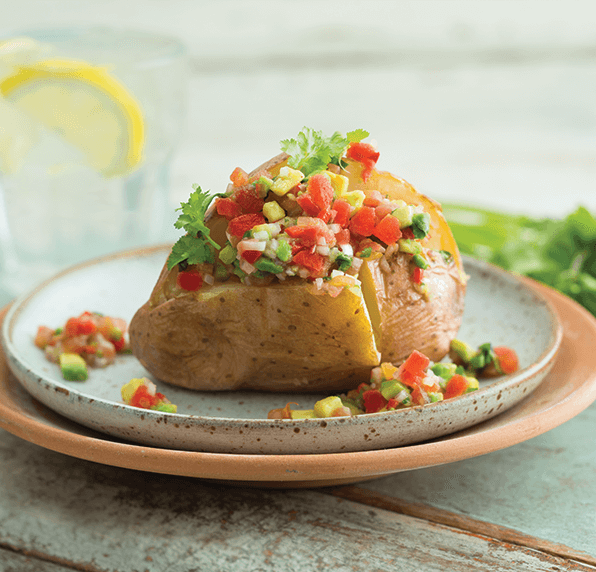 With thumbs and forefingers push potato towards the center and top with salsa.